In accordance with the Sustainable Groundwater Management Act (SGMA) of 2014, the Arroyo Santa Rosa Basin Groundwater Sustainability Agency (GSA) has elected to become the groundwater sustainability agency for the portion of the Arroyo Santa Rosa Groundwater Basin east of the Bailey Fault, outside of the jurisdiction of the Fox Canyon Groundwater Management Agency. The GSA is organized under a Joint Exercise of Powers Agreement (JPA) between the Camrosa Water District and the County of Ventura. This page will contain all public documents pertinent to the Santa Rosa GSA, including Board Agendas and public notices. 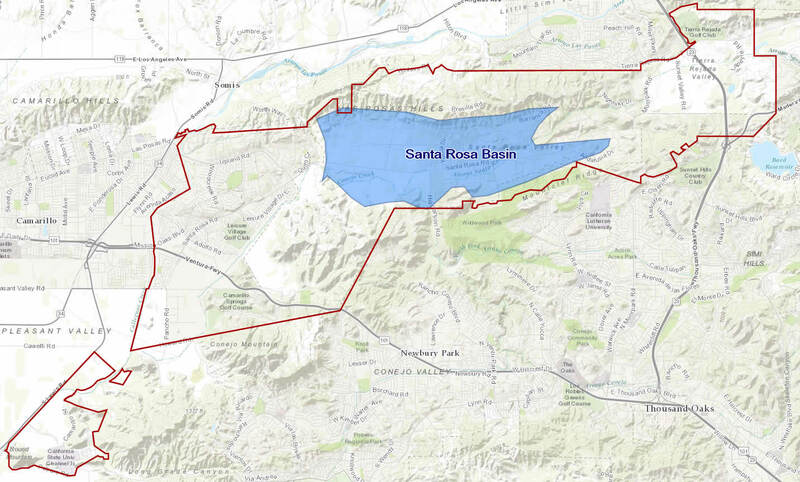 The Santa Rosa GSA Board of Directors held its first meeting on November 17, 2016, at 5:30 P.M, at the Camrosa district office, 7385 Santa Rosa Road in Camarillo. At that meeting, the Board appointed Gene West as Chair, Terry Foreman as Vice Chair, and Camrosa General Manager Tony Stafford as Executive Director. The JPA’s notification of its intent to act as the GSA is filed with the California Deparment of Water Resources. The 90-day period for other agencies to challenge the JPA’s declaration expired on March 8, 2017. Stakeholder engagement will be an important focus of the GSA, and stakeholder meetings will take place at regular intervals throughout the development of the plan. Please direct any questions about the GSA to Camrosa Water Resources Manager Ian Prichard, at IanP@camrosa.com. BOARD MEETINGS and MINUTES: GSA Board of Directors Meetings follow the same calendar as Camrosa Board of Directors meetings. Cancellation notices will be posted on the weeks that GSA Board meetings do not occur. Click on the meeting date to view the associated meeting or minutes; individual memos are also hyperlinked.